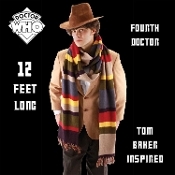 Amazing 12-foot Long Doctor Who-Tom Baker Scarf is what you’ve been waiting for! This isn't an ordinary multicolored scarf. 143-inches long! In the hands of the capable Doctor, it's a lasso, measuring tape and almost always saves the world from impending doom. Travel through time and space with this reproduction of the impressively long scarf worn by the fourth Doctor! As seen in Doctor Who, this scarf will wrap around your head several times, dangle to the floor, and trip up your enemies. Only the Doctor can save the world and start major fashion trends no matter what timeline he's in! Officially licensed BBC Doctor Who merchandise.